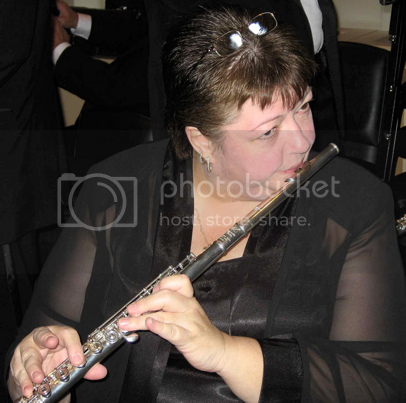 Yup, that’s me warming up backstage at Carnegie Hall on March 28, 2007!You are listening to an excerpt from the Stockton Concert Band’s performance of “Symphonic Duke” (arranged by The Tonight Show’s Tommy Newsome) at its Carnegie Send-Off Concert on March 24, 2007! WOW! What an honor! bet you have nice memories too. Wow, you are pretty talented musically. I am not, but have talents in the artistic area. Great photo of you. Have a great weekend. Mine is up, please stop by. How very cool! That must have been something! We’re visiting in south central Montana and will be going to a Choke Cherry Festival and a “What the Hay” event this weekend. I’ll be taking photos that, hopefully, I’ll be able to use in future photo hunts. wow, impressive!! I wish I could play a musical instrument. I never learned as a child. Wow! 🙂 Carnegie Hall! Very impressive. 🙂 You are clearly a very talented flautist! My human mom plays flute, but she’s just an “average” amateur. She played through five years of high school (high school used to go to grade 13 in Ontario) and has played a bit in Church since then. And how do you get to Carnegie Hall? Practice! Practice! Practice! I just knew you’d have some great music on here today for the theme and I’m happy to see I was right! If I ever get back to Stockton to visit my friends out there, I hope I can catch one of your concerts, too! WOW how fortunate to be playing at Carnegie! What an honor! Wow, I’m impressed. Great photograph. WOW! Another impressed photo hunter here:) Thanks for sharing!! !